He was a stunning black and tan. Classic, noble, and proud with keen eyes and ears. But on the inside, Tobias was falling apart. He had been loved once, but now he was in the shelter. His home, his job, his family, his everything was gone. His eyes told us that he was sad and confused and that he had given up hope. I asked him what had happened; all he told me was that it all happened so fast. Like a tornado had torn through his world, casting everything airborne in a whirlwind of change only to land broken and askew. Our rescue was contacted, and we brought him in. Because he was so shattered, we searched in vain for a foster family rather than place him in our kennels. And we knew through experience that rescue gives a new lease on life. But with our resources exhausted, we had no choice other than to place him in the kennels temporarily. Volunteers rallied around him, showering him with love and affection, carefully introducing him to other dogs, and championing him during his play time. He struggled with kennel life, but with time, he found a rhythm and settled in. He began to bond with other dogs and come out of his shell. Playtime especially seemed to pull him out of his slump. But we could tell he missed having a real home and a family to claim as his own. As time passed, his confidence grew. And as his confidence grew, his true self emerged. While he had a sweet and affectionate side, he was also a strong athletic male with energy to burn. His leash manners were nonexistent. Walking him meant diverting and directing his energy constantly or you’d find yourself waterskiing behind him. Meanwhile, a family from another county reached out to us—a large, extended family that had owned GSDs for thirty-five years, with grown children who had children and GSDs of their own. 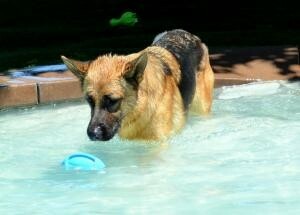 The family had recently lost a beloved male and companion to their female GSD, Bella. They were devastated, and Bella was inconsolable. She would spend hours mourning by his grave in the back yard. They’d been referred to our rescue by their daughter, and they submitted an application for Tobias. We handled the first meet-and-greet carefully. We’d been warned that Bella could sometimes be a bit barky and pushy, but that didn’t happen with Tobias. Bella looked at Tobias, eyes wide, mouth slightly open in amazement. And she was in love. Later, off leash, they played as though they were bonded littermates. But possibly the most defining moment was when the new family’s granddaughter stepped up to the fence to meet him. Tobias walked carefully to her as though he was navigating a mine field. He gazed into her eyes with gentle adoration and kissed her through the fence. And we wondered whether he’d been with children in his previous life. Perhaps part of his heartache had been not only losing a home, but also losing a family with children. When I asked him about it he said no, but he loved the innocence of children. They mean no harm, he said. Now Tobias has a home again. He lives with his new love Bella on a half an acre. He has a large family with parents, children, and grandchildren to love. 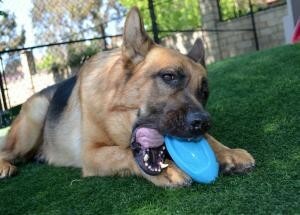 And he is part of a large pack that romps together when the family reunites for get-togethers. And although chaos and turmoil had separated him from his previous family, he has regained peace and love and all that he once lost.